This entry was posted in unexpected on December 11, 2007 by admin. After that monstrosity yesterday, this Nativity is a pleasant relief. I like the happy feeling here. My husband had the same expression after we came home with our firstborn, too. PARTY ON, J & M!!! I love how Mary’s haircolor perfectly matches her frock. I wish I could achieve the same sense of fashion nirvana. That’s a mighty big bottle for Joseph to finish off- good thing he has his shepard’s hook to steady his wobbly legs! Even though the lantern sort of resembles a bottle, it really looks like a clock to me. Joseph is waving the alarm clock around and grousing, “Do you see what time it is?? When is that kid gonna fall asleep? I have to get up early in the morning!” BTW, I had that same placid, benevolent smile as Mary after delivering my Kiddo 20 years ago. Of course, it was a C-section delivery, and I was IV-ing pain meds big time. I suspect Joseph is getting ready to pour out “one for my homies”..
Who’s down with the big JC? Why is Baby Jesus encased in a giant blue muffin? Why is Joseph’s hair bright BLUE? 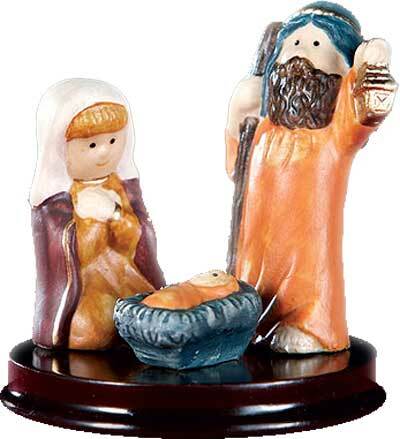 A certain Holy Family needs a makeover and color analysis.